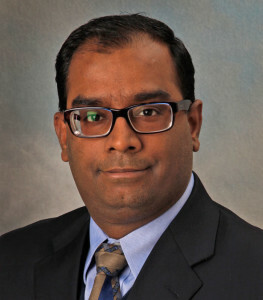 Susmit Suvas, Ph.D., associate professor of Ophthalmology and of Anatomy and Cell Biology for the Wayne State University School of Medicine, has been invited by Harvard University to address the 30th annual Biennial Cornea Conference. Invited by Harvard's Department of Ophthalmology, Dr. Suvas will present "Neuropeptide mediated regulation of the ocular surface homeostasis and herpes stromal keratitis" during the two-day conference, scheduled for Oct. 13-14 at the Schepens Eye Research Institute in Boston. Established in 1960, the conference is the largest academic cornea research meeting in the nation. It will address topics related to ocular surface, immunology and microbiology, endothelial biology, and innovations and new technologies emerging in corneal research. A researcher with the Kresge Eye Institute, Dr. Suvas has shown that expanding Tregs -- a subset of T cells -- in the early stages of an eye infection that can cause vision loss is effective in controlling initial corneal inflammation, particularly in herpetic keratitis, or eye herpes. The condition is the most frequent cause of corneal blindness in developed nations, according to the American Academy of Ophthalmology.